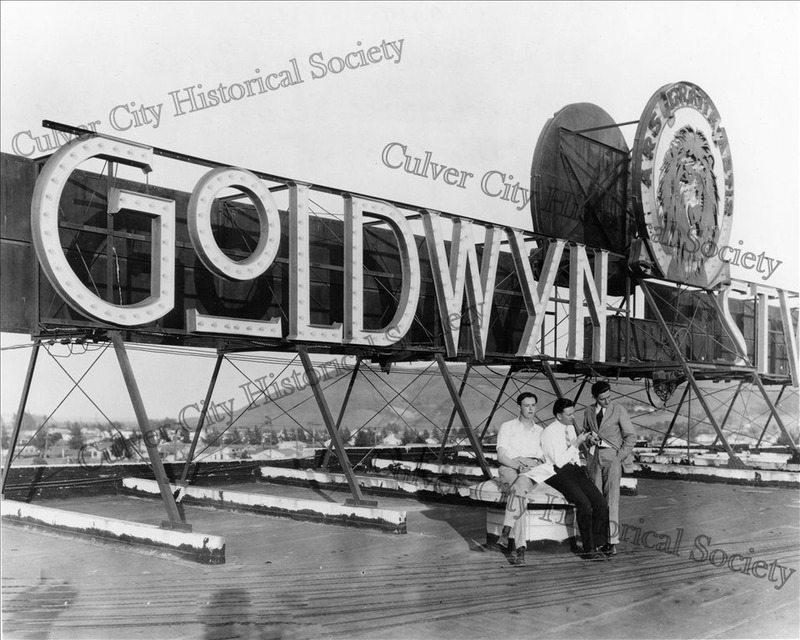 For decades, the Metro-Goldwyn-Mayer Studio’s rooftop sign once crowned the top of the tallest stage on the MGM lot. Recognized the world over, everyone who lived in Culver City at one time or another or who was a Los Angeles resident could see the sign from miles around. It became a Culver City icon and appeared in all media at one time or another worldwide. 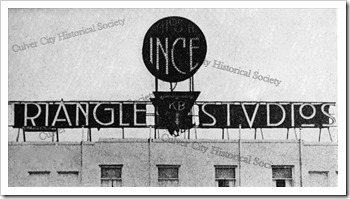 When Thomas Ince and Harry Culver were planning the new Ince-Triangle Studios in 1915, a metal sign was designed to announce the new studio by placing it on the highest building on the new lot. The Ince-Triangle Studio would be the first studio built in Culver City. The new sign would show the names of the companies that represented the Triangle Film Corp: NYMPC/KB (New York Motion Picture Corp. and Kessel and Bauman, founders of NYMPC) and producer-director Thomas Ince. The sign was first placed on top of the three-story administration building facing east and west on Washington Boulevard. At that time there were few buildings in Culver City and the sign could be seen for miles around. By the end of 1918, the Triangle Film Corporation split up and Thomas Ince moved his operations to his very own studio a quarter mile east further on Washington Boulevard (today it is The Culver Studios). 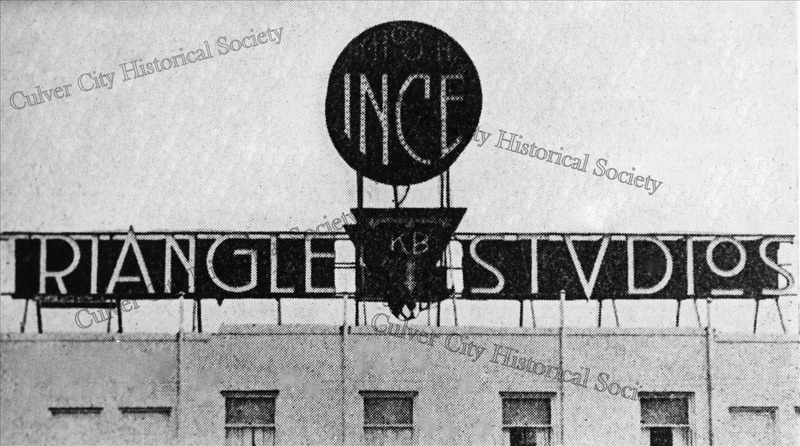 The next year, Samuel Goldwyn purchased the former Ince-Triangle Studio, and while the new Goldwyn metal sign was being built, a wooden box was placed over the former Ince-Triangle sign until the new sign was ready. 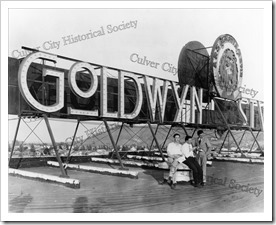 By 1939, the sign was moved to the tallest stages on the lot and one of the tallest buildings in Culver City at that time. From that vantage point, the iconic sign could be readily seen for miles around. It stayed there until it was moved again in the 1980s to the newly-built Filmland Corp. Center building, across the street facing the studio lot. The sign had been modified by this time displaying only “Metro-Goldwyn-Mayer” with a newly-designed round “Leo the Lion” on top. In 1992, MGM left Culver City and moved to Santa Monica where the sign was to top their new corporate office building, but due to special sign regulations in Santa Monica, the sign never was placed on their building but went into storage where it sits today. The historic studio lot carried the Lorimar name at the end of the 1980s, until Sony Pictures Entertainment became the owner in 1990, and the sign was changed to read Columbia Pictures on one side and Tri-Star Pictures on the other. shot on this famous backlot and we were granted access to this legendary filming site. This visit began my lifelong project to write an encyclopedia of the American Film Studios of which I’m still engaged. studio became known as the DeMille Studio. 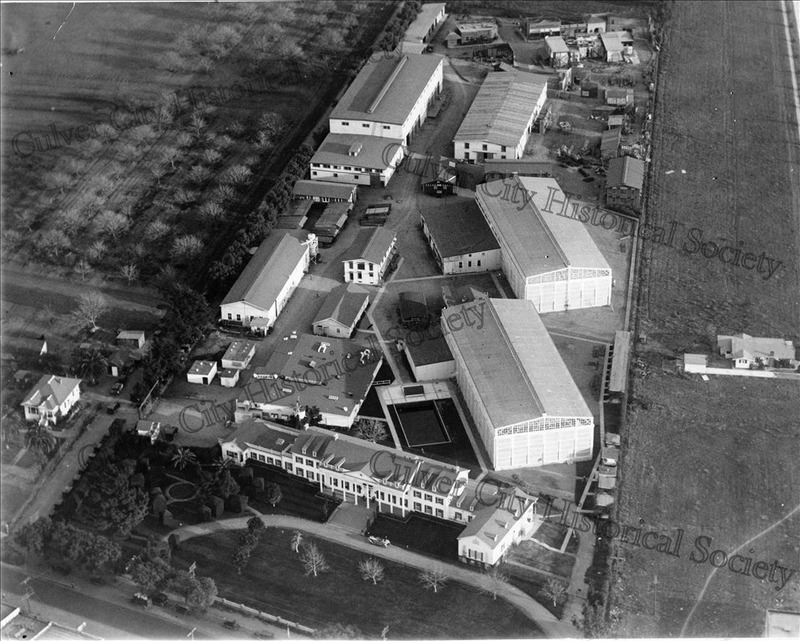 The “40 Acres” backlot was used for many DeMille directed or produced films such as The King of Kings (1927). was the RKO-Pathé Studio. Classic films such as King Kong were shot on all the RKO lots with the “40 Acres” backlot filling in for ‘Skull Island’ along with the famous colossal wall containing King Kong. Gone With The Wind, burning down the former King Kong jungle wall to make way for the Atlanta Railway Station. With the success of Gone With The Wind, the Selznick International entire RKO Studios assets were sold to Desilu, the company owned by stars Lucille Ball and Desi Arnaz. 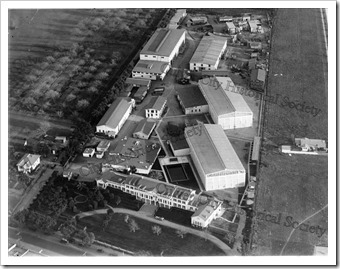 The Desilu Culver Studios became the home for many early 1950s television shows such as Whirley Birds, The Untouchables, Lassie, Hogan’s Heroes, the Andy Griffith Show among others. In 1962, director George Stevens produced The Greatest Story Ever Told at the studio using the same stages and the “40 Acres” backlot used by Cecil B. DeMille thirty-five years earlier. By 1967, Desilu sold out all their assets to Paramount and the studio became known as the Paramount Culver Studios. 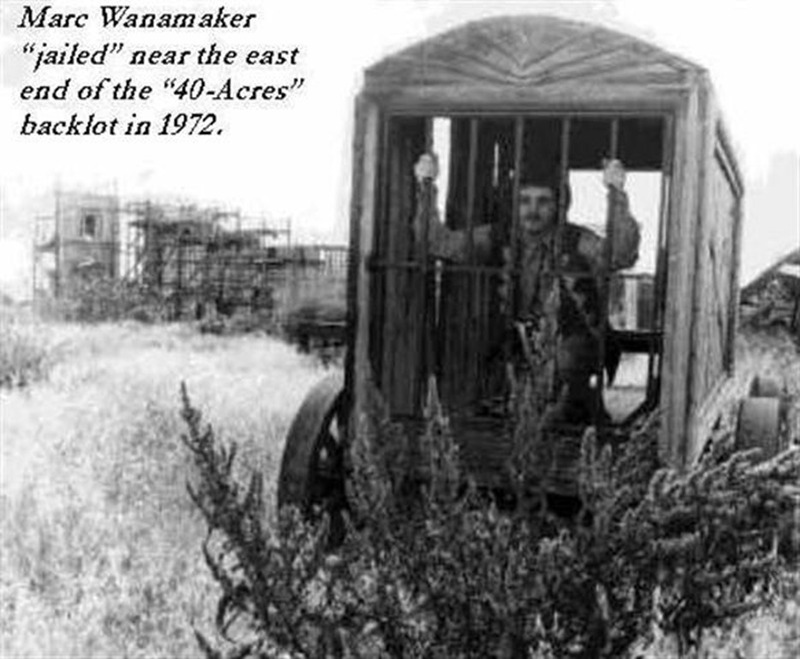 Paramount used the “40 Acres” and the main lot for a couple of years before they sold the entire lot to the Perfect Film & Chemical Company who changed the name yet again to The Culver City Studios in 1969. In 1981, the studio was sold again, this time to the Laird International Studios who operated it as a rental lot. Sadly, “40 Acres” was sold to a developer who demolished what was left of the famous sets still existing and created an industrial park, as it is today. The 1980s was a time for renewal in Culver City and the resident studios were already beginning to remodel and modernize their lots for the future of film and television production. It was also a time when the Metro-Goldwyn-Mayer Studio was in turmoil, with takeovers, and stock manipulations resulting in the former MGM Studio lot being taken over by Lorimar Pictures, eventually becoming MGM/UA. In 1984, developer Bruce Mallen and his wife Carol envisioned Culver City growing to be an important center for film and television production in the future. Using international financing, the Mallens went ahead and entertained the idea of building a major landmark building that would house entertainment businesses and support services. After securing the design and architectural plans for the construction of this “Dream” project, the Culver City Council and Chamber of Commerce embraced the idea. Such a landmark building would bring businesses and more jobs to the city. Groundbreaking launched the construction of the Filmland Corporate Center with representatives of the owner, Filmland Development Inc., and architect Maxwell Starkman Associates in attendance. 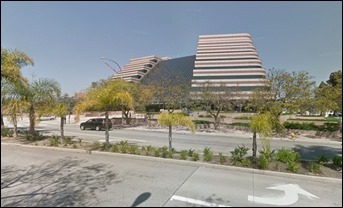 Chief Executive Officer Bruce Mallen and Carol Mallen, Executive Vice President, announced to the press that the property located on Washington Boulevard adjacent to the MGM/UA studio lot would be the new “heart” of the Culver City entertainment industry. The 820,000-square foot facility was slated for a December, 1985 opening. The horseshoe-shaped eight story building would be the largest building in Culver City’s history. The new building was designed to specialize in the area of support services to film and television companies and individuals engaged in the development, financing and production of motion pictures, television, video and other entertainment-related activities. There was controversy in the city during this construction period. Some said the building was too large and dwarfed the small town of Culver City. Others liked the building and said that this is what Culver City needed to recover its status as a film and television production center. By July, it was reported that “MGM/UA Leases Whole Floor of Filmland Center.” A lease was signed for 20 years for a total of 50,000 square feet of the third floor. The space would house the headquarters of MGM/UA’s motion picture marketing and distribution divisions when they moved in the following year. The center was also looking for moviemakers and television production companies as tenants as well as those that service the industry, such as lawyers, accountants and agents. The Filmland Corporate Center building design included a front entrance contour that surrounds the motorcourt where valet, taxi and limousine services are available. Beneath the street level lie three floors of secured parking for up to 1200 automobiles. The terraced façade is heightened by a landscaped atrium covered by a soaring ninety-foot canopy of glass. The Grand Lobby level provides access to many retail shops and services, including a gift shop, video store, newsstand, office supplies store and a financial institution. The Grand Atrium is capable of serving as a banquet facility which can seat up to 700 or it can be transformed into a reception lobby accommodating 1200 guests. Attached to the Atrium is the Garden Restaurant and the Producer’s Club. The building has six cutting-edge screening rooms and a fitness center. At this time, the Executive Operating Officer was N.P. Popich (financial partner) and Bruce Mallen as Chief Executive. The General Contractor for the project was the Turner Construction Company and the interior design firms included Integrated Design Associates and Depiero Associates. In March of 1986, MGM/UA moved into the Filmland Corporate Center. By July, more tenants were occupying the building including The Motion Picture Export Association of America and the American Film Market Association. At this time, after several years of negotiations, Lorimar Telepictures purchased the MGM Studio in Culver City. By the end of the year, MGM/UA moved out of their former studio lot and opened their new corporate headquarters in the Filmland Corporate Center. In 1992, MGM Studio moved from the Filmland Center to Santa Monica. The 15-ton MGM sign was taken off the Filmland building and put into storage on November 14th, 1992. With the coming of the new year 1993, Sony Pictures Entertainment took over the Filmland Center Building and renamed the complex, Sony Pictures Plaza. At the recent Culver City Historical Society special program with author Brian Taves, there were questions about the chronology and specific studio facilities of film pioneer, Thomas H. Ince. Questions such as, which Thomas Ince studio was built first in Culver City and when did Ince leave his original studio in Santa Ynez canyon (Inceville). There were also questions as to where Thomas Ince lived, since he moved from Hollywood to Beverly Hills in 1924 the year of his death. Ince came to Los Angeles from New York in 1911 to head up the Bison Film Company that had come to Los Angeles in 1909. It was thesecond film company to build a studio in Los Angeles after the Selig Polyscope Company which had been in Los Angeles as early as 1907. Selig opened the first permanent studio in Los Angeles in Edendale (on Glendale Blvd. in Echo Park) in 1909. The Bison Company came to Edendale and opened their first studio down the block in 1909 as well. By 1911, the Bison Company, under the direction of Thomas Ince, moved to Santa Monica to establish “Inceville” where Sunset Blvd. and Pacific Coast Highway intersect. By 1915, Ince had outgrown “Inceville” which had predominantly been a studio producing western and Indian genre films. At this time, Ince was producing war films, dramas and comedies that required a more factory-made production design, needing more space and modern stages and equipment that Inceville did not have available. Harry Culver, the developer of the future Culver City, needed an economic base for his new city he planned. Culver offered Ince land and plenty of space to develop a film industry in the new town. Ince’s parent company, The New York Motion Picture Corporation (NYMPC), put up the money to build a modern studio on Washington Boulevard which opened in 1915. 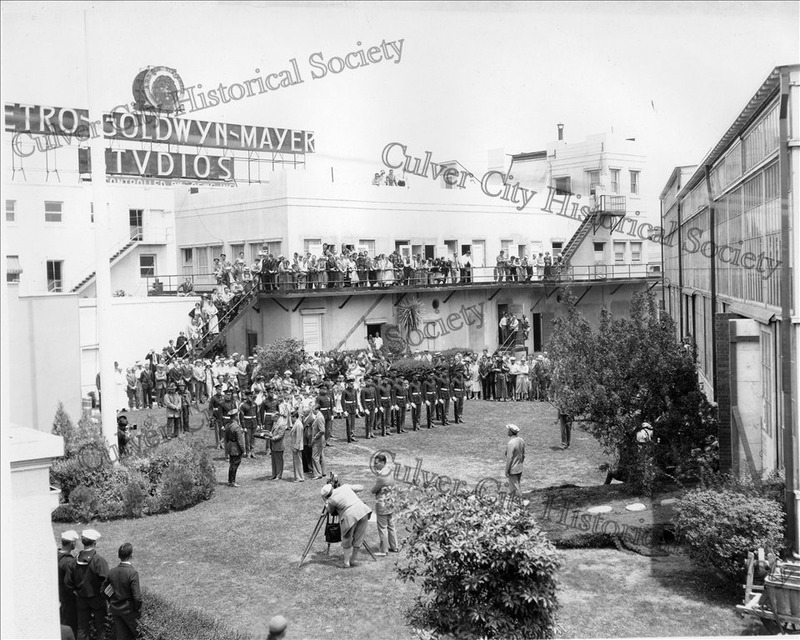 The well-known Colonnade entry is one of Culver City’s designated “Historical Landmarks.” This studio became the Goldwyn Studio in 1919 and by 1924 had become the famous Metro-Goldwyn-Mayer (MGM) Studios. 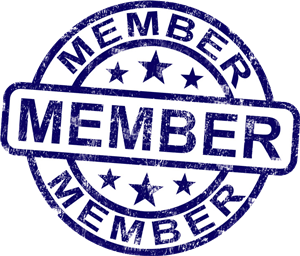 By 1916, the NYMPC was affiliated with the Triangle Film Corporation, and for two years the company was very successful until it’s principle directors – D. W. Griffith, Thomas Ince and Mack Sennett – left the company. By 1918 after WWI, Ince was looking for another studio site to be his own studio lot. With the demise of the Triangle, Harry Culver offered another deal with Ince to keep him and his productions in Culver City. A plot of land was found to the east of the former Ince Studio on Washington Blvd. at what is now Ince Boulevard. A new studio administration building was designed in the classical style reminiscent of Virginia’s Mount Vernon facing Washington Blvd.. The 14-acre main lot with a backlot, known later as the “40 Acres,” was to be another Culver City historic landmark. After Thomas Ince’s death in 1924, the studio was sold (with Pathé America) to Cecil B. DeMille in 1925. After about four years, DeMille sold his interest to Pathé and the studio was then known as the Pathé Culver City Studio. By 1928 after mergers, the studio became RKO/Pathé. By 1957, a number of other studios followed: Desilu Culver, the Culver City Studios, Laird International Studios, Culver Studio, etc. Ince first lived in Hollywood at Franklin and Bronson Avenues, beginning sometime around 1912. He built a beautiful Craftsman style house and compound which included several office buildings, tennis courts and a swimming pool. Since “Inceville” was so far away from Hollywood, Ince built another house high on a hill overlooking Inceville off of what is now Sunset Blvd. in the Pacific Palisades district. By 1923 Ince wanted to move from Hollywood and purchased a large tract of land in the Benedict Canyon district of Beverly Hills and built “Dias Dorados”in 1924 – a beautifully hand-crafted “Mission-hacienda” style rancho estate. Ince lived there briefly until his death in 1924, the same year the family moved in. He died in his bed there with his family in attendance. The house was later sold to his first mentor Carl Laemmle, the founder of Universal Pictures Corporation and Ince’s first employer in the film industry. Adventurer-journalist-writer Lowell Thomas said that Count Felix Von Luckner, German WWI hero, was coming to Los Angeles on an around the world sailing-lecture tour to talk about his exploits during the Great War. He was known as a “Gentleman Pirate” having captured and sunk many allied supply ships during the war. Despite the fact that he took up arms for Germany, he was recognized as having the gallantry and kindness to take prisoners during his exploits losing very few lives in the process. After the War, the Pope decorated Von Luckner adding to his twenty-seven decorations from many of his former enemies (see photo). Three captains whose ships the German naval officer sunk during the war welcomed him in New York on his world tour. On July 25, Von Luckner arrived at the port of Los Angeles announcing his “Peace Tour” and his love for America where he had lived and worked for eight years in San Francisco as young man. Having arrived on a converted sailing ship, the Vaterland, it was his first trip to the Southland. Upon his arrival, he announced to the press, “Aboard the Vaterland and we have one of the most valuable cargoes ever carried – that of friendship for America. Count Von Luckner was accompanied by his Swedish wife, Countess Ingeborg, who was anxious to visit Los Angeles to see her longtime friend, First National Star film Anna Q. Nilsson who was between pictures. Also accompanying Von Luckner was his former German Naval Captain, Julius Lauterbach, who was himself a “Gentleman Pirate” during WWI. The entourage stayed at the Biltmore Hotel in downtown Los Angeles and traveled around the Southland for a month going from one lecture hall, auditorium, luncheon and dinner to another. In August, at the first luncheon honoring Von Luckner, was the man who helped arrange the Southland visit, businessman Leon Kutner of San Francisco. Kutner was a longtime friend of Von Luckner and was the toastmaster of several of the events honoring the Count. Kutner, a German Jew, told the audiences about Von Luckner’s views of America’s importance as a world power and its prestige promoting peace in the post-war era. At the end of July, Countess Von Luckner and Anna Q. Nilsson hosted a banquet at the Biltmore Hotel with many friends stars of Hollywood. Among the notables attending were Ruth Roland, Priscilla Dean, Gertrude Olmstead, Norma Shearar, Mrs. Louis B. Mayer, Mrs. John Ford, Alma Rubens, Zazu Pitts, Lillian Tashman and others. Von Luckner and Lauterbach lectured at U.S.C. and U.C.L.A. stressing the face that they both were now on a mission of peace, their war experiences merely a memory and their chief desire to further cement the friendly relations between Germany and the United States. At this time both men spoke about their war experiences and their peace mission on KHJ radio. August was an important month for the Von Luckner party as they were to begin to visit the motion picture studios in the Los Angeles area. On one of these visits they were guests of Cecil B. DeMille at the DeMille Studio in Culver City. Along with the Von Luckner party were German Naval officers from the new German Naval Cruiser, Emden, also on the tour. They all met with DeMille, and were shown the sets used for DeMille’s The King of Kings on the “forty acres backlot” along with a tour of the studio. On September 23rd, it was announced in the L.A. Times that the Von Luckner party had visited Culver City, “Benjamin Shipman business manager of the Hal Roach Studios was host at a luncheon to Count Felix Von Luckner and Countess Von Luckner along with Captain Lauterback with all the studio executives, directors and stars at the studio restaurant.” The paper added that the highlight of the Count’s visit was with members of “Our Gang” and Laurel and Hardy. By January of 1928, the party had visited the Fox Studio in Hollywood hosted at a gala dinner by Universal’s President, Carl Laemmie. With the coming of the 1930s and the rise of Adolph Hitler, many German aristocrats rejected the Nazi government and were very worried that Germany might start another war. Von Luckner was one of the leading spokesman against this rise of Nazi power. He is now remembered for his struggle against the Nazi’s, his saving of a Jewish woman’s life, and his role in the preservation of his hometown from destruction at the hand of the German and American armies at the end of World War II. Culver City had hosted European Royalty and government leaders from around the world since the First World War with the Royal visit of King Leopold and Queen Elisabeth of Belgium. 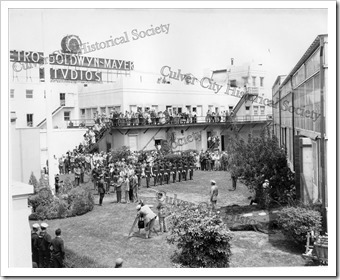 To this day, Culver City has distinguished itself as being a center for film production for over 97 years and is world famous for its film heritage known worldwide.